What happens when you fall in love with playing in mud! 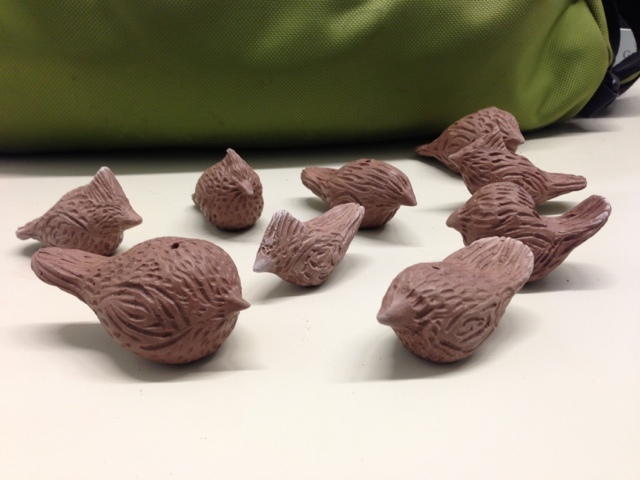 Last fall when I came back to the studio after a few year hiatus, the instructor, Lori Leaumont taught me how to make these awesome little pinch pot birds. Best 10 minute pottery project ever!! Pinch pots are simple hand-built pottery forms. They all start with a ball of clay and beginning with pressing a thumb into the ball, you can pinch the clay into a variety of different shapes, cups, bowls, or in this case, birds. 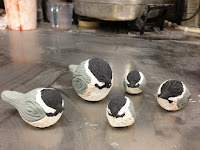 Since the shaping on these birds actually creates a hollow in the center, a small ball of crumpled paper is inserted before closing the form to keep the shape from collapsing in on itself. During firing, the heat of the kiln magically burns away to nothing. As I shaped my first bird, I immediately decided that Carolina Wrens had a shape that suited these little guys. The whole first batch of these ended up being wrens and a few cardinals. 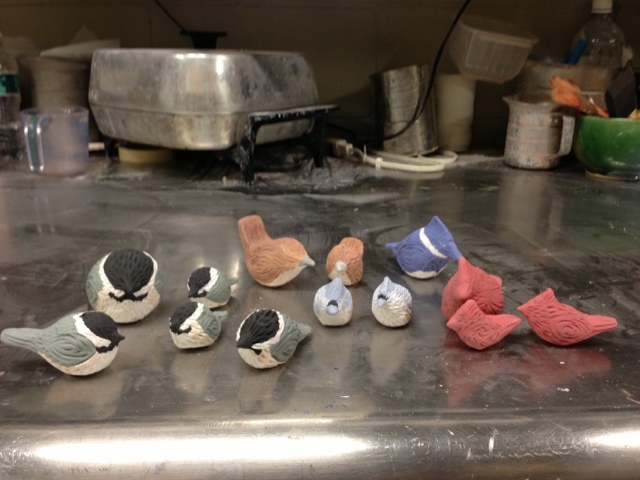 I started out doing fairly faint, simple textures on all of the birds, just using a needle tool. As I've progressed with the birdies, I've discovered that I can use a small loop tool to trim the texture in a little deeper to mimic feathers and the shape of wings. I've also started to focus on a few other Indiana birds that suit this form, chickadee, tufted titmouse, and kingfisher. Although I'd planned to do simple dip glazes on these birdies, their shapes turned out so well that I was foolishly inspired to handpaint them with underglazes. I'm still learning a lot about glazing, especially using underglazes. I was pleasantly surprised to find out that if I was willing to leave these birds with only with a matte finish--just the underglaze without a coat of glossy clear glaze--then I could color the whole body of the birds including the bottom, without having to stilt up each bird from the shelves of the kiln. 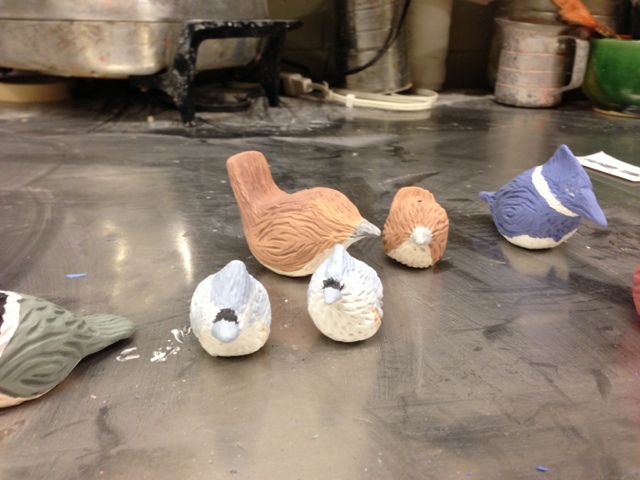 Unfortunately, hand painting the birds is a lot more time consuming than simple dip glazing. But, the end result on the birdies turned out so appealing that I'll probably be stuck handpainting future little guys as well. Find my next event on my calendar. Or contact me directly!